Body Designs: Singlecone Resonator guitars. Tricone Resonator guitars. From traditional to my own unique styles, cutaways and non cutaways or perhaps you have a design you would like me to build for you. Metal Body Guitar Materials: Choose from the bright tone of Brass, the warm mellow sound of Copper or the loud sounds of Steel. Crafted to fit your Hands: I can carve the neck to the width that is most comfortable for you. Quality Woods: Beautiful Curly Maple, Mahogany, Rosewood and Ebony neck options. Adjustable Saddle: Unique to Mattsen Single cone models, for accurate tuning when raising or lowering the string height. Electric Pickups: I can fit magnetic, piezo or both to suit solo or band playing. Various finishing options: Your guitar body can be plated in Nickel, polished Brass, Patina Copper, Antique Brass. 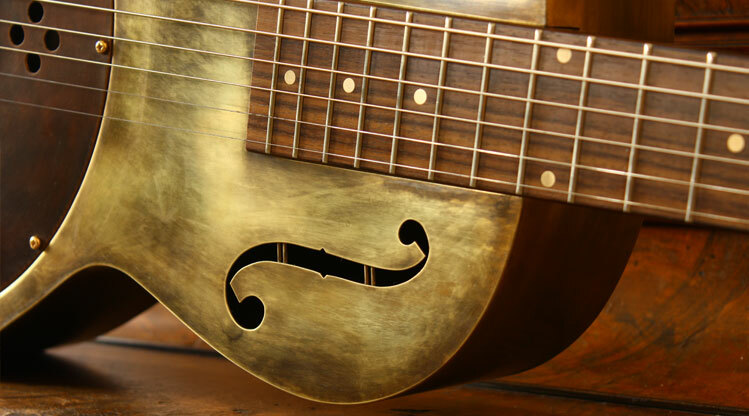 Craftsmanship Guaranteed: I build my resonator guitars to last forever. This is achieved by building in a manner that allows, if ever needed, to be easily repaired. Delivered to your door: I have sent guitars to the USA, Japan, UK, Australia and Europe. Watch your Guitar being built: Regular photo updates are emailed to you. Together we can build a very beautiful guitar, guaranteed to inspire great music and satisfy your requirements. Please feel free to contact me to discuss your resonator guitar.